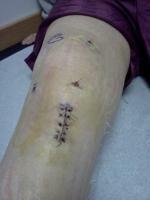 I had an acl reconstruction with calaxo screw and allograft approx. a year and a half ago. I had problems with the screw backing out and required an additional surgery. Additionally I had major systemic problems with use of polymer screw. The doctors are now concerned about the enlarged bone tunnel as well as possibly my original graft may be at risk for failure. I am facing an additional surgery, and am interested in different bone graft substitutes that are more natural in nature so as to hopefully prevent any additional systemic symptoms. Also, what are the screw options if in fact the acl needs to be reconstructed?